There is little else in the world more spooky to me than spiders. My children would strongly agree with me as they seem to have inherited my arachnophobia. This fear extends to spider webs, without a doubt. 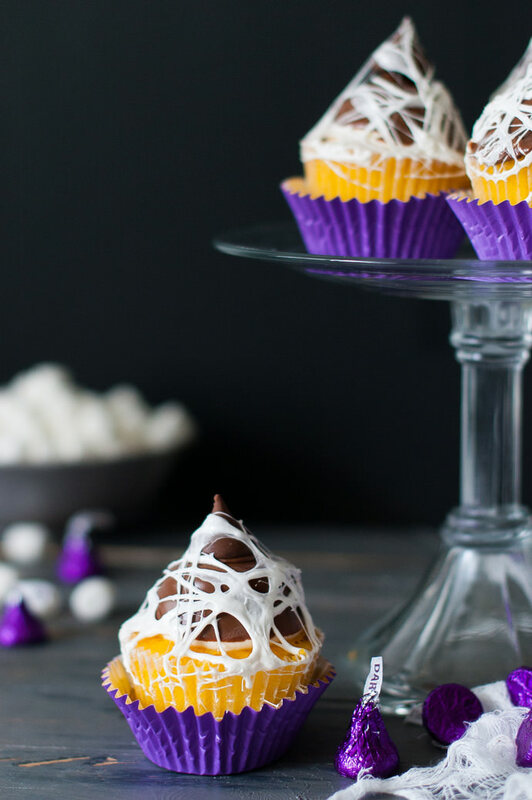 So when we are itching to create a spooky, extra creepy Halloween treat, the spider theme easily tops the list. 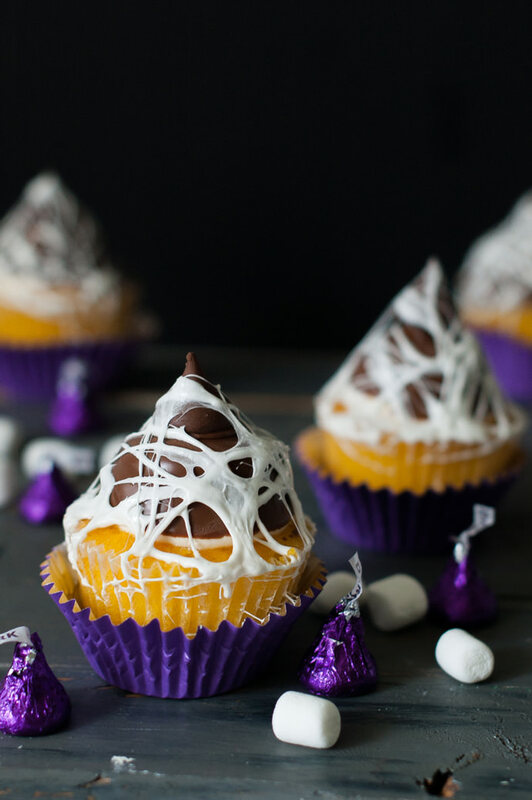 These cupcakes are covered in marshmallow “webbing” that is made by melting down mini marshmallows and using your fingers to stretch the gooey mixture over a HERSHEY’S Kiss topped chocolate frosted cupcake. The Kiss on top gives the shape of the frosting a somewhat sinister element with it’s delicious chocolate point. I almost thought the web covered cupcake looked so creepy that it might deter the children from trying to get their hands on one! As it turns out, I was so very wrong. Apparently, there is no such thing as a dessert that is too scary. Even faux spider webs couldn’t stop my littles from gobbling up their eerie treats without a second thought. Little plastic spiders would have been the perfect embellishment for these cupcakes but I don’t think my little spider-fearing heart could handle it! Place the mini marshmallows in a microwave safe bowl. Microwave at 15 second intervals until puffed and melted. Stir with a fork to deflate and mix together. Set aside. Place the baking chips in a small bowl and microwave for 15-20 seconds, or until melted. 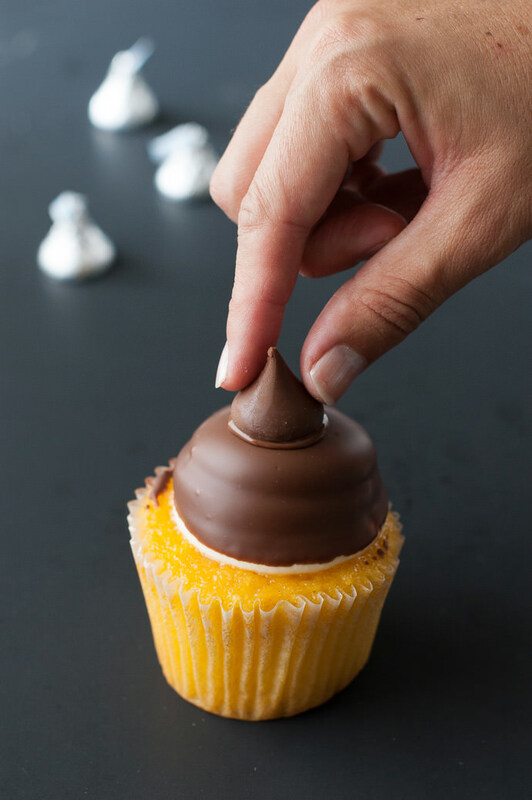 Unwrap the HERSHEY’S Kisses, dip the bottom in the melted chocolate and place them on top of the frosted cupcakes. 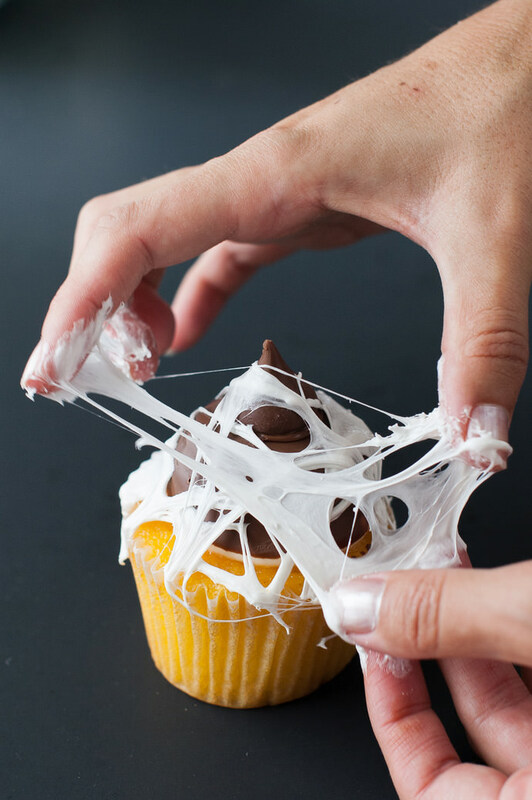 To cover the cupcake in marshmallow web, scoop a little bit of melted marshmallow between your fingers and spread your fingers apart to make the marshmallow stringy. Lay the marshmallow strings over and around the frosting with your fingers, coating the frosting until the desired level of coverage is achieved. NOTE: Cupcakes can be refrigerated after the marshmallow web topping is applied but do note that it will become slightly sticky from the condensation. This post is sponsored by HERSHEY’S. I love how much the marshmallow looks like a spider web! What a great idea for a halloween or fall party. This looks so fun to make!